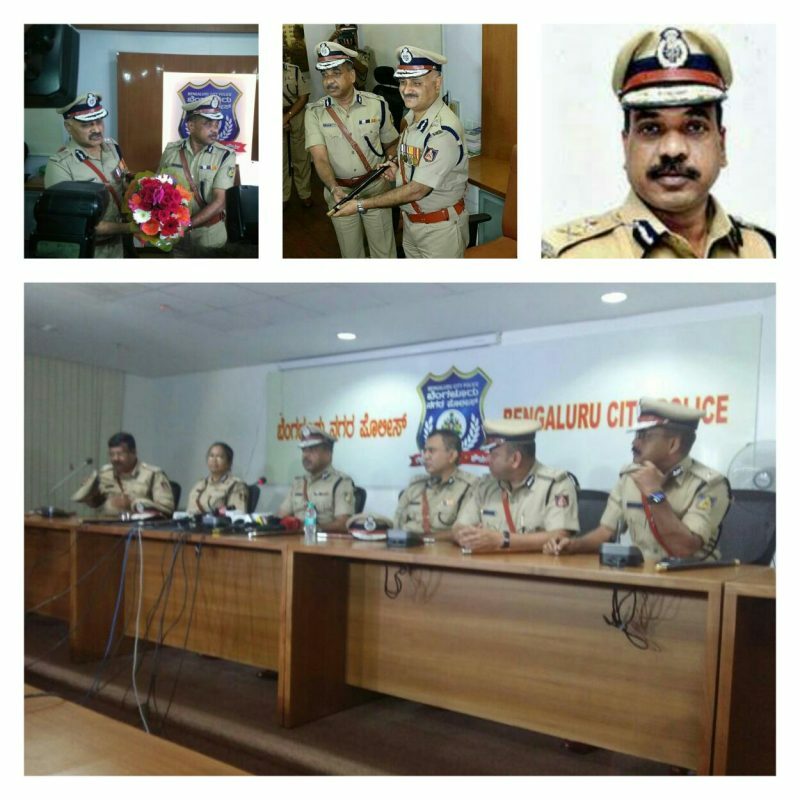 Home / City News / T Suneel Kumar is New Police Commissioner Of Bengaluru City . T Suneel Kumar is New Police Commissioner Of Bengaluru City . “Professional Policing is Mandatory . The Karnataka government led by Chief Minister Siddaramaiah on Monday named T Suneel Kumar as Bengaluru’s new Commissioner of Police. In a sudden development, Commissioner of Bengaluru Police Praveen Sood has been transferred on Monday. T. Suneel Kumar, who was Additional Director General of Police (ADGP) and Managing Director of Karnataka State Police Housing Corporation, will instead take the mantle as the head of the city police. Mr. Sood, who had taken charge on January 1 earlier this year, is posted as the ADGP Communications, Logistics and Modernisation. Sood, who had only three months left for his promotion as DGP, was expected to serve as commissioner until then. However, a strong reaction to the arrest of pro-Kannada activists, under the section of causing communal disharmony, resulted in the premature transfer. The change of guard at the helm of the Bengaluru City Police, with T. Suneel Kumar replacing Praveen Sood, came as a surprise not only to the top brass, but also the officers who were transferred. T Suneel Kumar born in a remote village in Andhra Pradesh, playing marbles, gilli danda, climbing trees, and getting beaten up by teachers. He studied agriculture and specialized in breeding pumpkins, but finally, donned khaki to serve the state. Starting from Humnabad, Suneel Kumar has served in various parts of the state.in KGF as SP and back to Raichur, before returning to Bangalore as South division SP. “Bangalore South division was most challenging.after taking charge as additional commissioner of police (law and order) in Bangalore.There was a variety of crime, law and order situations like Dr.Rajkumar was Kidnapped, lawyers protest against media and police and so on. I enjoyed the challenges,” he said. T Suneel Kumar after assuming the charge as Commissioner of Police addressing the press conference at his office in his first press conference he said, I am bound to perform my duties.Protecting law and order,detection of crime, protection and safety of women and clampdown on illegal activities will be core areas of policing. In the coming days I hope to interact more with the media.The ways and those initiatives which my predecessor have taken they are implementing the work initiatives I will be continuing as for the safety of the citizens we will introduce new measures.When asked as you were addressing the public grievances before when you was Additional Commissioner of Police law and order he said as you all know I used to address public grievances and i will be continuing the same to make more people friendly policing as we are for the public their safety and our top priority will be women’s and children safety he added. All officers as, Addl CPs as, Malini Krishnamurthy,R Hitendra,Nanjundswamy,Hemant Nimbalkar,S Ravi,other officers as,D C Rajappa,M N Anucheth,Dr.S.D.Sharanappa,Chandra Gupta,Dr Boralingaiah,Dr.P.S.Harsha,Ajay Hillori,Abhishek Goyal,Ram Nivas Sepat, Jinendra Khangavi, Chethan Singh Thakur,Bhorse, Narayan,Dr.Shobarani V J,Sarah Fathima,Nagendra Kumar,with other officers were present and welcomed the new Commissioner by presenting a bouque as protocol. Though sources denied any out-of-turn transfer and termed the changes as part of routine transfers, speculation was rife that the stern action against activists who defaced Hindi words in Namma Metro signages, cost Mr. Sood his job. In the recent days Sood warned pro kannada activists by telling that it is important to give prominence to kannada language in Karnataka.Kannada language is people’s right and pride. If kannada is not given prominence in Karnataka then where will it get prominence ?. But if law and order is violated than there will be a problem and strict action will be taken. We kept quiet when one organization violates law and order and others will follow it for other demands.It is necessary to give importance to kannada language and I think it is not necessary to impose any other languages we will support wholeheartedly if everything is done in accordance to law and order he added. Mr. Sood, however, said that he did not believe that his transfer had anything to do with the issue. “We have followed the law. Transfers are administrative matters unlinked to the issue,” he said. Mr. Sood had one of the shortest stints as the city police commissioner – seven months. He took charge on January 1, 2017 and was expected to hand over the baton on October 31, 2017 when he was due for promotion as Director General of Police; the city commissioner’s post is the rank of ADGP. Praveen Sood said as a commissioner my efforts was target citizens. Great sense of fulfillment we have done as this is the shortest period I have served in last 57 years and in this seven months there was no law and order issues and I had great satisfaction.I have utilised my all days of service even on Saturdays and Sundays too as this is the last opportunity where you can do hands on your own media is helped in giving wide range of publicity of Namma 100 . I have given challenges as 21 days challenge to public if their passport verification is pending more than the alloted time please meet me in my office on Saturday between 3 to 5 I used to sit in office but no one has come to me . My most priority was citizen centric there were no law and order incident in my period I had a good and fantastic officers who have done good work in detecting crime in the west I have M N Anucheth, South I have Dr.S.D.Sharanappa and in North I had Labhuram IPS they were fantastic and dynamic officer in detecting crime and to handle traffic we had a traffic supremo as Hitendra R . Today morning I visited the police colony with DCP Chandra Gupta to inspect the underground work and drainage work in the police colony and I have sent Newsletters message to 20,000 Constabulary. Recently I started looking after traffic as on Sunday I visited the Gurudwara road in ulsoor to address the traffic . In 2008 I introduced blackberry and today it is changed into PDA. More than 9000 vehicle which were used to Rot near stations I have got disposed by auctioning the vehicle. War on drug peddlers and overstaying foreigners continues and our team has done tremendous work as if we compare the statistics of 3 years is done in just 3 months many foreigner’s involved in drug peddling are arrested. We have introduced Namma 100, Suraksha APP,Pink Hoysala,Vehicle Actuated Adaptive Signals installed. Technological upgradation of traffic signals for optimum utilisation has been introduced,more than 9000 vehicles auctioned in last 6 months.Work in progress. It’s a long procedure through courts, 13 Rowdies were booked under Goonda Act and sent to jail, and the good case we have detected as Kamanahalli case as without complaint by taking suo motto case of molestation we arrested all the accused for the heinous crime in which the lady was molested and gropped on January 4th this year our team of officers have done a fantastic work by registering a case without complainant to bring confidence in public that we will not tolerate crime against any citizens or women and children. Till today I have not exposed the victim and after two months the victim identifed the accused and had confidence on us this was a very challenging case for me after taking charge, and Beat Policing across city in Joining hands with Public for maintaining peace, harmony and crime prevention by increasing the beat policing across Bengaluru city and at last I can say I thank all the citizens of bengaluru and Signing off as CP BLR after 7 eventful months. Loved everyday interacting with you all and initiating citizen- friendly initiatives thank you all and finally I can say that I have never breached the code of conduct he added. The police had booked 36 Karnataka Rakshana Vedike (KRV) activists under the stringent Section 153A of Indian Penal Code for causing communal disharmony. This had come under severe criticism with many, including prominent writers like Prof. Chandrashekhar Patil, condemning the ‘excessive action’ against the activists. Mr. Sood’s defence of the stern action and statement that ‘breaking law would not be tolerated’ triggered a social media campaign for his transfer. He made sure people can reach him and his team on social media. Joined IPS in 1986, he served as SP of Bellary and Raichur districts. He has been Deputy Commissioner of Police (Law & Order) & Addl. Commissioner of Police (Traffic) of Bangalore City and Commissioner of Police of Mysore City.